On Tuesday, November 10, in the burial vault under the alter of the graveyard Church of the Assumption - a part of the Holy Trinity Monastery in Jordanville - Right Reverend Archbishop of Syracuse and Trinity LAURUS and local priests served a panakhida service at the tomb of the ever memorable Metropolitan Philaret (Voznesensky), former First Hierarch of the Russian Orthodox Church Abroad. Thereafter, the tomb was opened as it had been decided to transfer the relics of Metropolitan Philaret to a new crypt behind the Monastery's Cathedral. The transfer was scheduled for November 21, the Day of the Archangelt Michael and All Angels. To the singing of Holy God.. the coffin was placed in the middle of the vault and opened by Archbishop LAURUS. 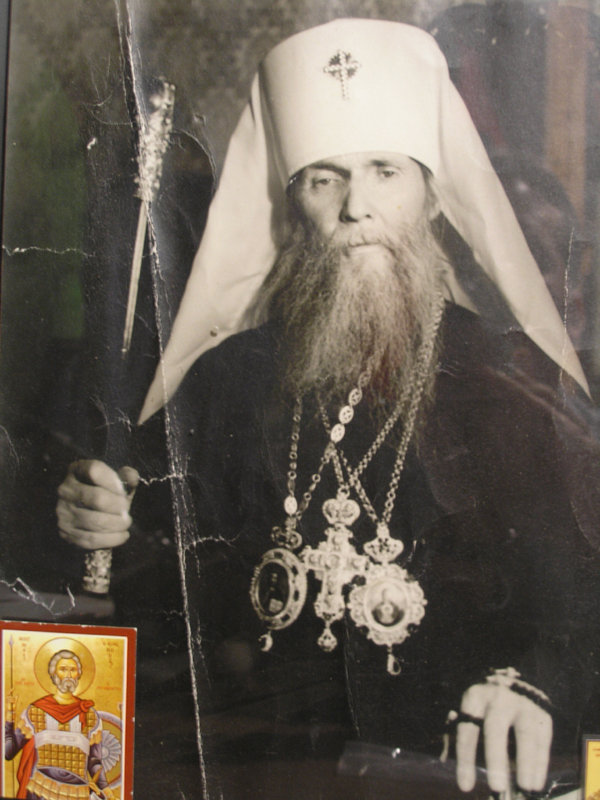 Metropolitan Philaret's raiment, his New Testament, both panagias, the cross and the paten covering his face were intact. His wrists were white in color. No smell was noted. Having made the sign of the cross, His Grace LAURUS lifted the paten veiling the face. The remains of His Eminence the Metropolitan were found in perfect integrity; his beard and skin were completely incorrupt. According to an eyewitness, the remains looked very much like the relics of the Miracle-Worker, Archbishop John of Shanghai and San Francisco. Vertograd-Inform: Would you tell us when and how the relics of Metropolitan Philaret were recovered? Archpriest Konstantin Fyodorov: It happened on Tuesday, November 10. His Eminence Laurus, Archbishop of Syracuse and Trinity, decided to serve a panikhida in the church vault of the Holy Trinity Monastery's cemetery. After the service, in the presence of Archimandrite Lucas, Archimandrite Peter, Archpriest Grigory Naumenko and lay brother Peter, His Eminence proceeded to open the coffin to prepare it for relocation to the Holy Trinity Cathedral (where there is a special sanctuary behind the alter where Their Eminences Metropolitan Anastasius, Archbishop Averky and Archbishop Tikhon are buried). Upon opening the coffin, all those present greatly rejoiced, as the relics were found completely untouched by decomposition. According to Father Grigory, these relics looked just like the relics of St John of Shanghai and San Francisco. Evidently, the same phenomenon was at work in the case of Metropolitan Philaret. Vertograd-Inform: Father Konstantin, where are the relics now? how are they being worshipped? do they work any miracles? Archpriest Konstantin Fyodorov: Since I have received an invitation to attend the transference ceremony, I assume that the relics are still in the churchyard vault. They could have been taken out and placed inside the cathedral. I don't really know. Vertograd-Inform: When do you think the official glorification of His Eminence Philaret could take place? Archpriest Konstantin Fyodorov: At first, evidence of miracles will probably be collected. Miracles are, indeed, already happening. I would like to share with you an account of a minor miracle which was not, however, that small for my dear mother. Before coming here, we traveled around France extensively. Once we had a seven-hour drive ahead of us. After two hours of driving our car's engine died. I thought we had run out of gasoline. I kept retrying the pedal but it didn't work. We were in the middle of nowhere, and my mother started to panic. I told her: Don't worry, I'm wearing His Eminence Metropolitan Philaret's epitrachelion. Moreover, I have the Life-Giving Cross on me. Why don't you pray instead. Two seconds later she burst out, from the depth of her heart: Your Grace, Father Metropolitan, please help us. Your child is sitting here. Don't mind me, I'm unworthy, do it for his sake. Send us on our way!. I turned the key, and the car started as if nothing had happened. My mother was overjoyed. As to the glorification of His Eminence Metropolitan Philaret, a relevant decision of the Synodl is to be expected. The fact that the relics are untouched by decay is probably insufficient grounds for glorification, so evidence of miracles will have to be collected. But I am certain that the glorification ceremony will be held very soon. Vertograd-Inform: Father Konstantin, how do the laity, clergy and hierarchs of our Church feel about this event? Archpriest Konstantin Fyodorov: Everyone I know is certainly experiencing paschal joy right now. We are all jubilant: the priests, the hierarchs, and laymen. We are rejoicing both in Russia and abroad.